Chag: Remember when I said the Exia review would be up by sometime around Wednesday? Well, that turned out to be a blatant lie as the new summer job was more tiring than I imagined, so sorry about that! Anyhow, welcome to the fifth installment of Weekly Highlights! This week we have a full course of bishoujo figures on the way with no mecha entries. Without further ado, let’s get do it! As of the time of this writing, Hobby Hovel is currently reeling its most spectacular flop in recent history. It seems people just aren’t all that interested in over-muscled men in tight clothing (unthinkable, I know!). The MG Gouf Ver. 2.0 review I wrote while in China that is scheduled to go up in a couple of days consist of what I expect to be a very dry 2,000 word + rant that only the masochistic would read in its entirety. The situation is dire and I need to breathe some life back into Hobby Hovel, and what better way to do it than a review of Gundam 00’s original poster boy – Gundam Exia? As the latest TV entry (no, Sangokuden doesn’t count) of the ever-expanding Gundam franchise, Gundam 00 probably doesn’t need an introduction. But in case you don’t know anything about it, here’s a little crash-course: About three hundred years in the future, in a time where humans no longer cry over oil spills thanks to the vast solar energy system built around the earth, a small private military group known as “Celestial Being” surfaces. The sole purpose of Celestial Being is to piss off every major world power with by butting into every armed conflict with their technologically advanced death machines known as Gundams. These Gundams, which are powered by green pixie dust (otherwise known as GN particles), are so far above the current level of weapons technology that they are virtually invulnerable (think Tony Stark in his Iron Man suit). One of these peace-enforcing death machines is known as Gundam Exia, piloted by a Kurdish former child-soldier with a fetish for pointy things. Together they merrily travel around the globe, making plenty of widows as they go. …On second thought, you should probably refer to a Wikipedia entry or something for a synopsis if you need one. Anyhow, being a MG kit of a recent main mobile suit, the MG Exia unsurprisingly received a lot of attention. Bandai, being the devious marketing genius that it is, foresaw this anticipation and released a special “Ignition Version” of this kit, which features metal-plated blade parts, LED light for the chest, and extra parts to make the Exia Repair (thanks for the reminder, hamstercorp!). Because I wasn’t crazy about the prospect of having shiny bits on an otherwise matte-finished model, I opted for the regular version. With out of the way, on with the review! I looked into the question of limit on comment length. Turns out this has been a long-standing issue with IntenseDebate. To further complicate things, my attempts at switching to Disqus was unsurprisingly unsuccessful. Maybe I should switch to WordPress eventually, but until then, please feel free to make multiple posts if necessary! The weekly review has been pushed to mid-week from now on. This is partly because I dropped the ball this week and partly to space out the updates more evenly across the week. 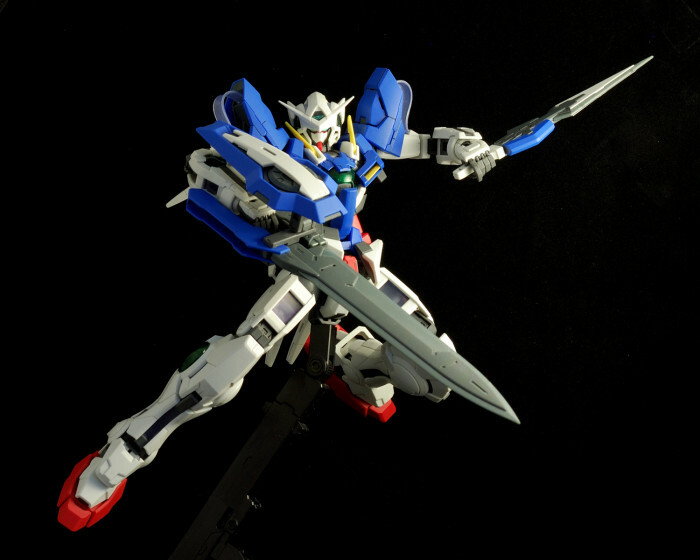 A MG Exia review will be post around Wednesday, so look forward to it, plamo fans! Without further ado, let the ranting begin! Of the many virtues of the original Mobile Suit Gundam series, its memorable antagonists always held a special place in my heart. After running away from the White Base with the Gundam, the young Amuro Ray meets the charismatic Zeon lieutenant Ramba Ral and his lover Crowley Hamon – arguably a pair of parental figures in Amuro’s troubled emotional life. However, as fate would have it, Amuro and Ramba Ral soon discover each other’s identities as the ace pilots of opposing camps while locked in deadly mobile suit combat. While Amuro respects the skilled veteran, his obligations to the crew of the White Base (as well as his concern for his own survival) demands him to exercise his duties as a soldier, making for another tragic chapter in his odyssey. 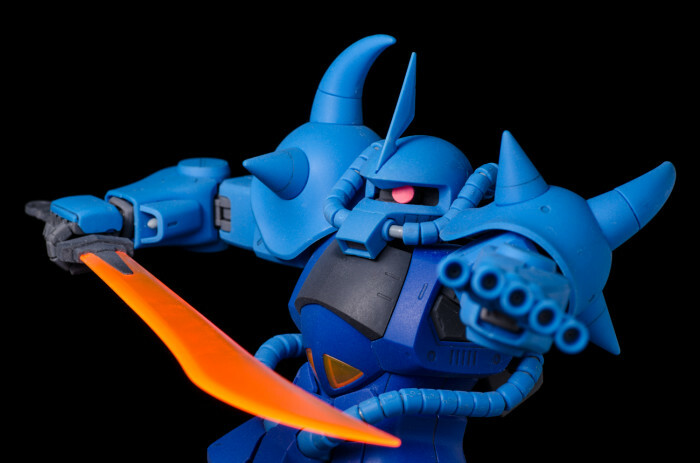 Of course, this review isn’t about Rambal Ral, but rather his big blue bruiser – the MS-07B Gouf. As Ramba Ral himself puts it: “This is no Zaku, boy, no Zaku!” Caught between the Zaku II and the Dom, this land-oriented mobile suit was never produced in significant numbers during the One Year War. However, as a bigger, faster, and stronger brother to the Zaku II, the formidable close-range capabilities of the Gouf were demonstrated plentifully in Ramba Ral’s assaults on the White Base. However, as the 2.0 version of the MG Gouf was released after a string of Zaku II variants based on the new 2.0 frame, the suspicion of a rehash inevitably hovers around this new take on the Gouf. Well, rest assured – while the MG Gouf Ver. 2.0 does share a number of traits with the MG Zaku II Ver. 2.0 kits, it sufficiently sets itself apart from the pack.